Voilà French Bistro offers classic bistro dishes in a exquisitely designed setting filled with more than a touch of the real France, authentic lunch and dining at its finest. 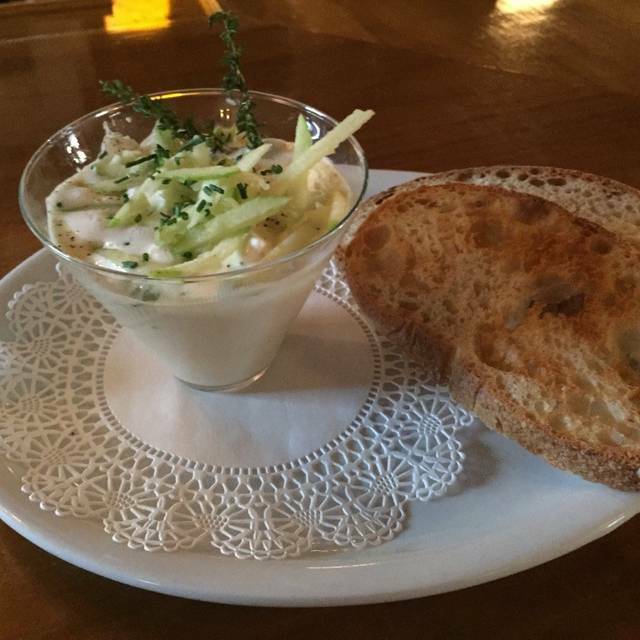 We are the place for mussels, seafood, foie gras, escargot and more. New owner since the 1st october 2015, a new menu is crafted by the french chef Jean- Christophe, which reflects the best of East France and the freshest ingredients of the season. Jean Christophe's personal touch and tireless devotion to his creations has made a night at Voilà the perfect place for date night, friends getting together, a nice family dinner, or private party. great staff, wonderful food. nice and relaxing place to eat a meal and not feel rushed. This was our first time at Voila. The food was excellent......great, hot bread. 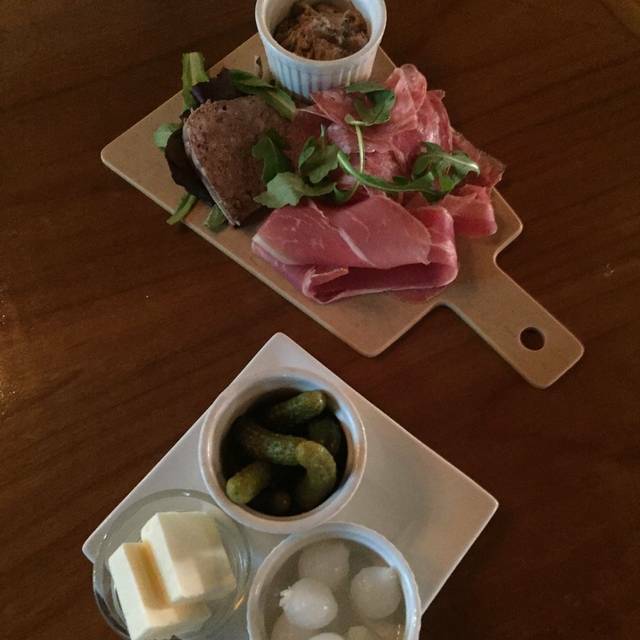 We enjoyed the cheese plate first. The Cahor Malbec was very good. My wife had the special of the evening; a chicken dish; which she commented was very good. I had the duck (canard l'orange) which was delicious.......very well prepared.....reminded me of the meals I had last summer in the Dordogne and Lot River Valleys in France. And the Creme Bruleé as fine. Really fine evening on the patio. We will be back! Thank you. Authentic French Cuisine! 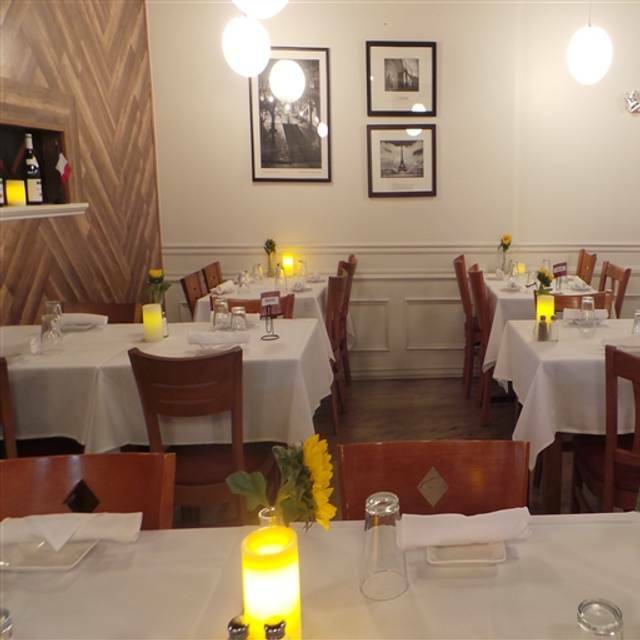 This was our first visit to Voila French Bistro but it won't be our last. The experience was WONDERFUL. 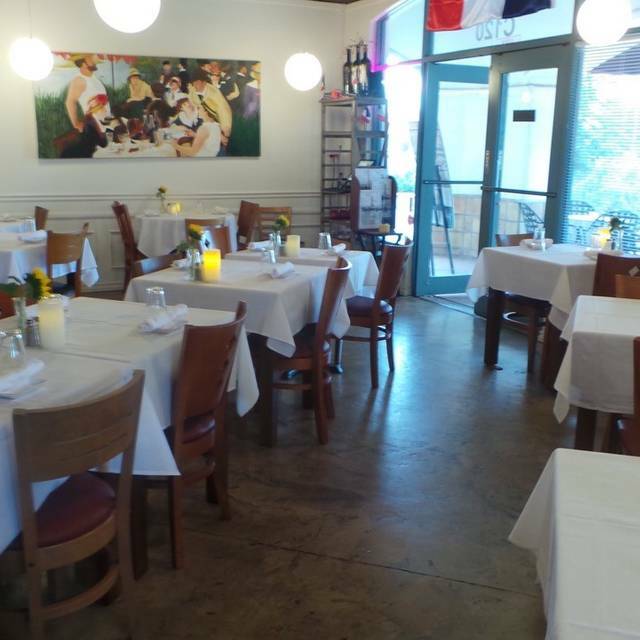 They have a great selection of menu items and a very nice reasonably priced wine list. We started with the Fromages and a bottle of Bordeaux (La Chapelle de Meyney Saint-Estephe). Delicious. For entrees we had the La Sole and the Le Foie gras de canard. Both were wonderful. And we finished with L'ile Flottante (Vanilla cream, beaten egg white & caramelized sauce). Out of this world! 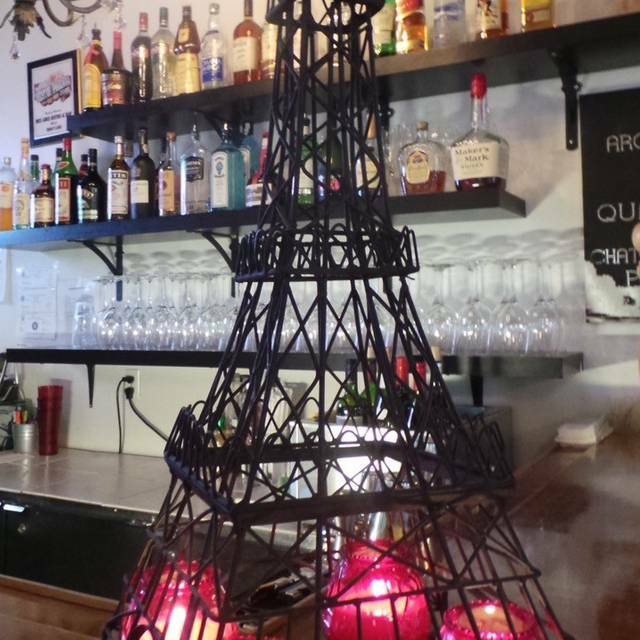 If you want to try some authentic and outstanding French cuisine then by all means visit Voila French Bistro! You will be happy you did. We had an excellent experience here. The serving staff was on point. The owner stopped by to ask how our dinner was. I really like it when they do this. It shows that they truly have an interest in your opinion. Our onion soup was outstanding, the bread with aioli cheese sauce was delicious, and you had the option of the oil and balsamic vinegar at the table. The duck confit delicious and tender. Had I known, I would have asked for light sauce as it was a bit too rich for my taste. The potatoes au gratin was just enough to accompany the duck. The tomato halves were a nice garnishment on the plate. Presentation was lovely. My husband had the salmon in a pancake of sorts. He loved it. A very intetesting presentation. I love this place! I am a serious foodie and I can not say enough good things about this restaurant. I usually am not excited about eating out (unless is sushi or sometimes Indian) because I always get disappointed and think, I can make it better at home. This place is different. Great food, try the scallops in puffed pastry it is really special, and definitely have the soufflé. I am still trying to figure out their recipe. The atmosphere is lovely and it is quiet enough to have a conversation. If you like good food definitely try it! Incroyable! This bistro is amazing. My husband and my father took me here for my birthday and it did not dissapoint. I am a huge lover of French food and, after living in France, I have incredibly high expectations. Voila Bistro reached those expectations and beyond. Bravo Voila et merci pour la très bonne expérience!!! Delicious food and excellent, unrushed service. A wonderful place for a lunch where one can enjoy food and conversation with companions. We had a wonderful meal with friends at Voila, which we expected. What surprised us was the wonderful sense of place. I won't say we were transported to Paris but we did feel the essence of France the moment we walked in the door. The aromas, candlelit tables, and starched, white table cloths served as the perfect backdrop to the cuisine and the charming owner/hostess who greeted us and served our meals. My dish was salmon, potatoes and spinach served with a creamy sauce. We also had roast duck with baby potatoes. How were these ingredients prepared? Perfectly. The flavor of each ingredient stood on its own yet blended with the other ingredients. The result was distinctly French. Highly recommended. Wonderful romantic bistro for lunch. We sat outside with same great food and service. Enjoyed La Quiche au Saumon, La Bouchée à la Reine (best item), Mimosas, La Profiterole, and Cappuccinos. Perfect for a special occasion! We need to try for dinner. So fun, food was fresh and delightfully served. Wine list was lovely and dessert even better! I was there with 3 other women sat outside and thoroughly enjoyed the whole experience. 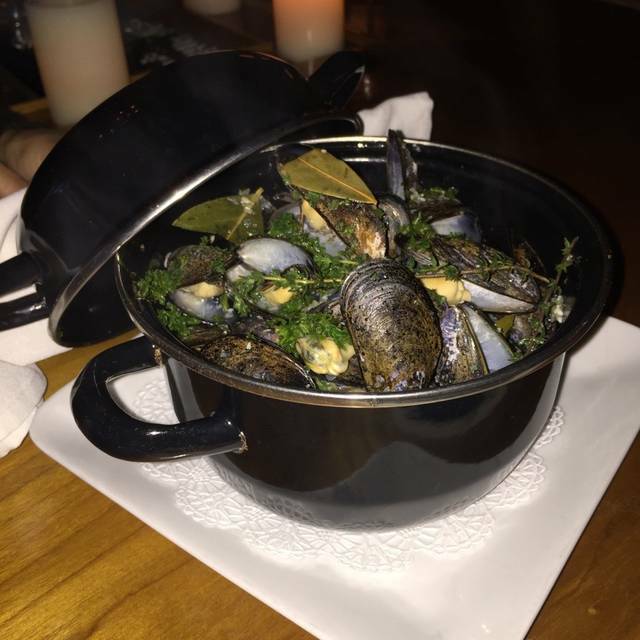 The mussels, the fois gras and the chocolate raspberry souffle were our favorites, but everything was delicious. It was well worth the drive from Sedona! Splendid meal, and atmosphere. You feel as if you are back in France. Once again, we enjoyed a fabulous dinner, including appetizers and dessert. Thank you, Voila! We will be back. Disappointed in the food this time. Previously we loved this restaurant but the last two times the food has missed the mark. Scallops were over cooked and had a dark brown crustz. Fish was mushy. They were very busy and understaffed so perhaps that has something to do with it. Escargot was excellent and onion soup to die for. Entrees were perfectly prepared and artfully presented. Service was right on point but without affectation. Hope to meet the chef on our next visit. Voila French Bistro was a wonderful experience. The food was well prepared and presented beautifully. What a wonderful dining experience. A real french bistro. food was authentic, classic and delicious but not pretentious. We like that it is a small restaurant with a charming atmosphere. But the best thing about it is, no open kitchen, no clanging dishes, no incredibly loud music. It is so nice to enjoy excellent food and wine and be able to converse with dining partners. We are no strangers to Voila. It is our go to place to celebrate a special occasion because we are always wow'ed by the fine dining experience. The food preparation is nothing short of delicious, leaving you wishing there was more on your plate. There is a nice selection of wines & their souffle is to die for. This quaint French neighborhood gem never disappoints. 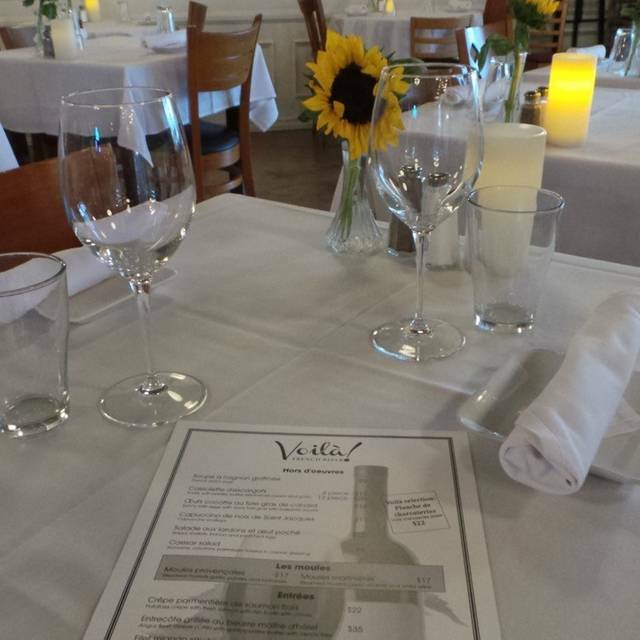 Voila is a warm and inviting place. 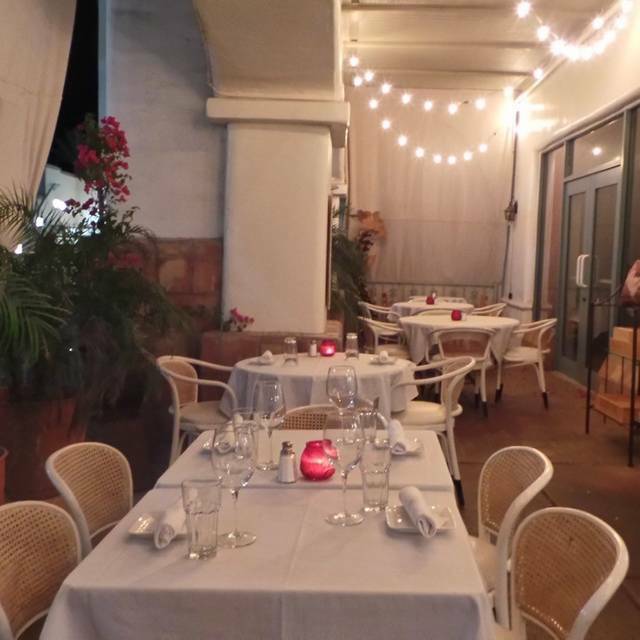 We sat inside in the comfortable and quaint dining room, but there were other parties seated on the outdoor patio. The food was absolutely delicious. My daughter had the filet with a rich sauce, which she proclaimed the best filet she had ever eaten (no offense taken!). My wife and I both had the expertly prepared and presented large scallops in crisp puff pastry. Delicious! We would definitely recommend this place to friends, and we will be back. I’ve been to France many times and this was not the French food I’ve remembered. None of us was impressed with their meals. The desserts were, however, quite delicious. We ate four different entrees. I had the choucrote with pork, ham and sausage. The sausage tasted like a Costco hot dog. The ham was tough and fatty. The smoked pork was too tender. I liked the sauerkraut. My sister-in-law has the chicken. It was tasteless. The other two meals were fine. Everyone knows the French don’t eat chicken in restaurants so that was shame on us. With all the amazing restaurants in Scottsdale this was one to be missed. By far, our favorite Scotssdale restaurant! 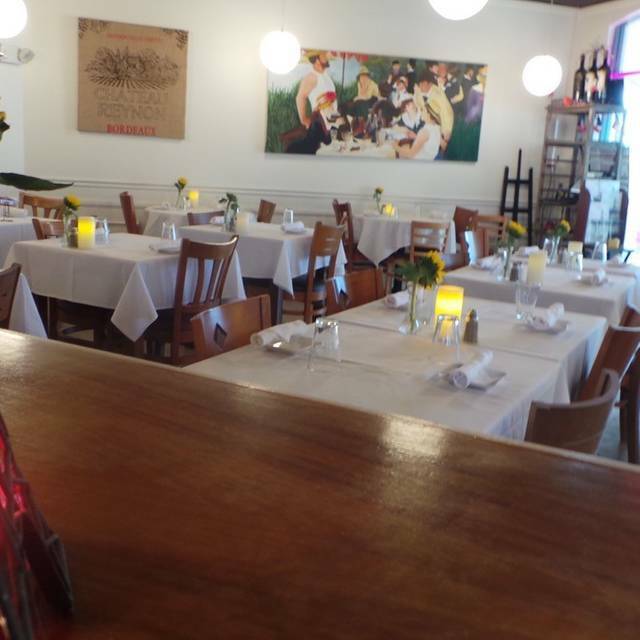 Voila French Bistro is what a French bistro should be! This was an outstanding dinning experience for a special occasion evening. Five Stars is the rating in every aspect of this restaurant. Go and see it for yourself. The appetizer and main course were mediocre and dessert was poor (stale roll and relatively tasteless ice cream and sauce). The quantity was fair but the price was outrageously high considering the above. Saw the restaurant featured on Plate and Pour. Food was well plated and presented but onion soup had a strange herby overtone. Escargot was parfait! Nice wine list. We reserved a table outdoors not knowing we would be fully under cover (and shade). All in all, a nice but uninspired lunch. food was great ! Service was good but missing that extra little step. Absolutely fabulous. A great restaurant find. I will go back again and again. I have dined at this restaurant many times and I am never disappointed. Between the ambience, staff and food the whole experience was warm and relaxing.